10 Stories and 10 Songs in stereo and performance tracks that celebrate highlights from the Life and Teaching of the Apostle Paul. 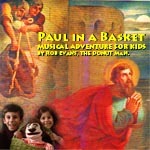 His adventures in song: From Damascus Road, Escape in a Basket, the Earthquake, then a new song, "Shipwreck". The narratives make application and show how his adventures are keys to his lessons found in the Bible: About being a 'New Creation'; How Christ strengthens us; The Fruit of the Spirit; Christ's Death and Resurrection. For the finale: the brand new 1st Cor. 13: "The Greatest is Love". The CD-rom track has two "Word" files that you can edit and print out yourself. The "Director's Script", which has narration, song lyrics, staging and prop suggestion. The "Audience Hand-out" has narration and lyrics. This is a great musical for kids and families. It can involve choir if you choose; also children as actors and narrators. "The Donut Man" personna is not in this production, nor is Duncan. Rather, this musical is for churches that have lots of kids who want to read, act and sing! Here Comes Down Paul in a Basket!